Now that the dust has settled in free agency, we have a better idea of how NFL teams’ running back depth charts look heading into the NFL draft, which is scheduled to begin on April 25. Some teams decided to spend money in free agency in order to acquire their new starting running back, while other teams chose to pass on free agents and will add to their backfield through the draft. Andy, Mike, and Jason discussed the biggest winners and losers of free agency in their episode from a few weeks ago, which you can listen to here! The guys also recently discussed their initial running back rankings on the podcast (Part 1 / Part 2), and my fellow writer, Ryan Weisse, broke down their analysis in a great two-part article series (Part 1 / Part 2). Check out all of these awesome resources to help you, the fantasy football owner, understand more about the running back position as we look ahead to the 2019 season. Rankings and running back depth charts are sure to change after the incoming rookies have a landing spot, but what a team decides to do in the draft will tell us a lot about how they value their current starting running back as well as the backups behind them on the depth chart. What I’ve decided to do is summarize each team’s current running back depth chart as it stands today. These are sure to change, and I will put together an updated depth chart and article once the draft is complete. The three colors used are explained below. A team listed in green is a team that I believe will be an excellent landing spot for a rookie. If drafted to this team, he could immediately become the team’s starter. My top landing spots for rookies include the Tampa Bay Buccaneers, Philadelphia Eagles, Houston Texans, and the Oakland Raiders. 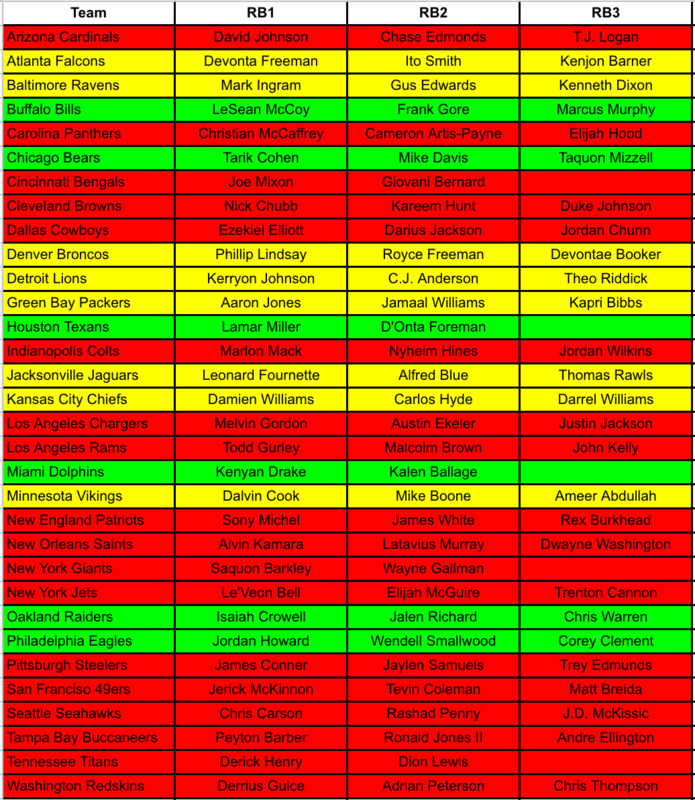 On the other hand, a team listed in red is a team that already has their starting running back on their roster, making it very unlikely that a rookie who lands with this team will have any fantasy relevance in year one. In most cases, these teams have a stud workhorse back, such as a Saquon Barkley, Todd Gurley, or Ezekiel Elliott. If a rookie lands on this team, he will have a very slim chance to get touches his rookie season barring injury. A team in yellow is a team that’s somewhere in the middle. They have a guy in-house who is a capable running back, but if they draft a rookie, he could become the starter or at least work his way into a timeshare as the season progresses. For fantasy purposes, guys like Josh Jacobs, Miles Sanders, or David Montgomery could become immediate starters for your fantasy lineup if they land on a team in green.